There are many ad-networks offers publishers to generate revenue by monetizing their website traffic by placing their ad code in their website Or Blogs. Some of the Ad networks even pay high amount for publishers & some Ad-networks require high traffic to join their network as a new Publisher. It’s a bit difficult for small publishers to join such ad-networks. There are some Ad-networks which offers low traffic websites & blogs to join their network. Popup Ad networks are among those Ad-network which accepts almost all the websites & they don’t even look for high traffic. Also Popup / Pop-under Ads are the best choice for websites which don’t have any ad space left to display banner Ads. There are number of Popup / Pop-under Ad-networks are there by which publishers can earn revenue by monetizing their website traffic. But when it comes to Popup ad network, then POPADS.NET is the best & Top Ad network to Choose. Why POPADS.NET is the best Popup Ad-network for Publishers? PopAds.net is best because this Ad-network allows both high & low traffic websites to join their network. This Ad-network is specialized in providing pop-under Ads. The best part of the Popads.net is High CPM rates compared to other Popup ad networks. Popads.net pays very good eCPM rates for publishers. However, eCPM varies for different country traffic. If website is receiving traffic from English speaking countries such as US, UK etc., then Popads.net offers high eCPM rates for such traffic. But, publishers will get average eCPM (Between $0.60 – $3.00 for thousand impressions) for worldwide traffic. PopAds.net offers very low payout threshold of $5 only & daily payout option as well. This means, whenever Publishers earn a minimum of 5$, then they can withdraw their earnings daily & even 5 times a day. Steps get started with PopAds.net as a New publisher. 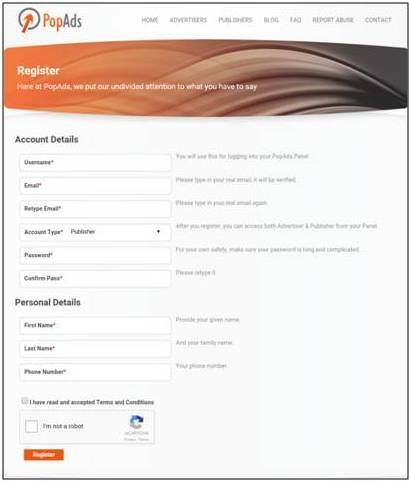 Registration procedure is very simple & easy. New users just need to fill the signup form with proper details. Once the signup procedure completed members can login to popads.net with proper login credentials. Publisher’s Dashboard section allows members to find grouped stats of all their websites traffic & details of their earnings with simple graph. This section allows members to generate custom earning reports. Members can check what is the CPM rate they are getting, How many impressions they got & also they can view detailed report by changing the Date & time range. Members can see how many websites they have added to Popads.net & they can check the status of the the website weather it is approved Or Rejected. This section allows members to add new-websites. When new members register to Popads.net they can directly go to this section & add their website with details to be filled in the appropriate field.Then they can submit the website for review. It will take 24-48 Hours to review New websites. Members can check weather the submitted website is approved Or not in the websites section. Once the website is approved, Members need to add the Ad code in their website in-order to generate revenue. Members can get the Ad code from Code Generator section by selecting the particular website. After selecting the website members simply need to click on the generate button & then just copy the generated code and then place the code any where between <head> and </head> section. Members can even find the installation instruction of the code below generated ad code. This is one of the best option that PopAds.Net provide for members to check weather the Ad code is installed correctly on members website. There is a blank field where members need to provide the URL of the website. then it will be monitored to check Ad code installed properly or Not. This section allows members to Add, change Or Modify their password, User name, email Id, & any other personal information. Billing section allows members to withdraw their earnings to their desired payout account. There is an option ” Withdraw ” from which members can choose their payout Processor. 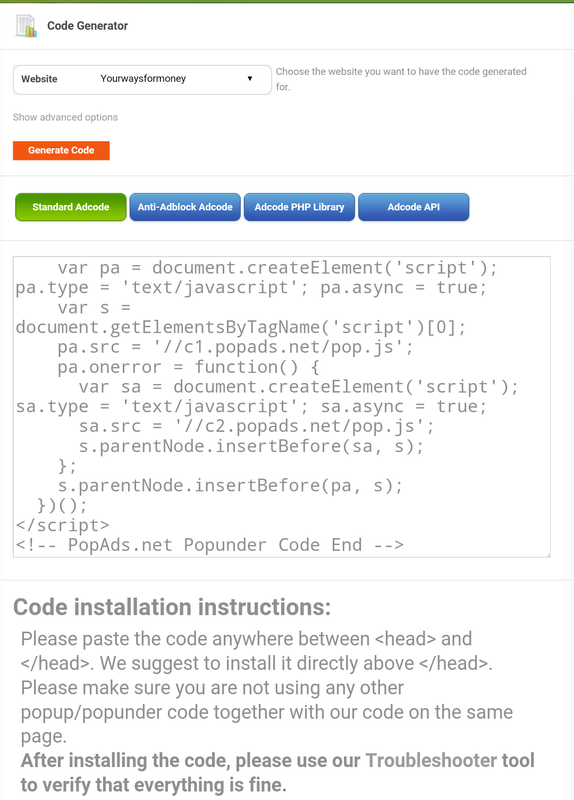 Popads.Net supports several payment processors such as, PayPal, AletPay/Payza, Payoneer & Bank / Wire Transfer. There is another option “Auto withdrawal ” from which members will get an option to make the system automatically request for payments on their behalf. In this section members will get several answers regarding their Queries. Members will find several frequently Answered Questions (FAQ). If members still have any issues, Then they can directly contact PopAds.net customer support team from this section using a simple contact form. PopAds.net offers publishers to generate 10% of extra revenue by introducing new members their Ad network. Publishers will get 10% of revenue earned by the invited members. In this section members will get Referral link & also several formats of Banner Ad codes. There is no doubt that Popads.net is the best Popup | Popunder Ad network among all other Popup Ad Networks. They Pay very good eCPM rates & also they accept all types of websites. There is no traffic requirement to Join this Ad network. Almost all the sites will get approval. Approval procedure normally takes from 24-48 Hrs. Minimum payout is $5 with fast payout. Members can withdraw their earning whenever they reach min of $5 even 5 times a day. How much New publishers can earn? Publishers can earn high revenue if the traffic comes from English speaking countries such as US, UK etc. There is no fixed eCPM rates. Average rate differs from $0.60 – $3.00 depending upon the quality of the traffic. PayPal, AletPay/Payza, Payoneer & Bank / Wire Transfer. My name is Rahul Co-founder of SisterAds Ad Network. If you like popup ads then i promise no other networks (except few) can pay more than i pay to our publishers. Our Minimum CPM rate is not below $5 and average is $10-15 for US Visitors,for Asian countries like India minimum cpm is $1. If you trust this comment at least try once i promise you will be our publisher at the end date of your blogging. Thank you! NOTE- I didn`t leave our contact details here because somebody call it spamming, so please search in google. I am using Dualshock wordpress theme for desktop version (Customized a bit) & Elicit theme for Mobile view. Thanks for your valuable comment. Glad you liked the site. Do come back for more interesting articles. Hope to see you again. New publishers would do much better when enrolled into one of the new ads networks (google a bit and pick the best ones) because there is less competition in there, instead of struggling to make a few cents on a large ads network where the traffic gets pushed by a couple of strong publishers. I agree most parts but, Popads is not conscientious. Because Popads.net is typical “RATE-PLAY” company. If you use Popads.net ad code in your website and watch the ‘RATE CHANGES’ for some months, you will understand what the “RATE-PLAY” trick of Popads.net is. Your RATE will be decreased gradually. It would be better for you to find other more conscientious ad company than to work with Popads.net.